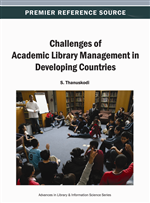 Nigeria is one of the developing countries where many challenges are affecting the management of its academic libraries, especially in the area of Information and Communication Technologies (ICT) application. Academic libraries are libraries in Higher Education Institutions (HEI) that are established to provide information resources and information services in support of the research, teaching, learning, and community development objectives of the institutions. However, despite the overwhelming influence of ICT, the information superhighway, and the open access initiatives across the globe, the extent of ICT adoption, application, and utilization for the provision of information services in Nigerian academic libraries is nothing to cheer. This chapter, which adopts a descriptive approach, examines the following: conceptual explanation of ICT and the case for its application and the state of ICT and the challenges of ICT application in Nigerian academic libraries, with recommendations on the way forward.